Challenge: CL Charlotte needed a comprehensive page to feature their upcoming coverage for CIAA week. 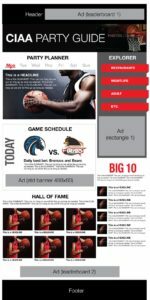 The editor and publisher wanted a “one-stop” page to house all their content with ample advertising space for sponsorship throughout the week. The look needed to bold and simple to navigate. The page also needed to be update dynamically with little if any interaction in the backend to update the page. Solution: Because this is a party guide, I decided to manage the content using tags. I created the layout using html5 and CSS3 then encoded components to pull content featuring CIAA tags and key blog topics like “Editor’s pick” for daily features. We also created an RSS component to pull latest Twitter and Instagram photos featuring the hashtag #ciaa.